A rendering of the new Limelight Hotel's climbing wall. The centerpiece of the almost-finished commercial core, the 54-foot-high public climbing wall is the tallest of its kind in Colorado and sports six self-belaying routes that range from beginner to advanced. Particular care was taken to make the wall seem like real rock; its painted granite-like surface is covered with naturally colored and shaped holds, as well as authentic-looking cracks. In fact, some features on the wall even replicate portions of iconic climbing routes from the Grotto area along Independence Pass. Enclosed in five stories of glass, the climbing wall is almost entirely visible from the public plaza below, another new addition to Base Village. Intended as a year-round activity hub, the plaza is dominated by an ice-skating rink in the winter that will become an events lawn next summer. With seating areas around fire pits, a pop-up bar made out of a shipping container, and the skating rink and climbing wall in close proximity, the plaza offers people plenty of reasons to linger. “We wanted to make sure there are multiple things going on,” says Calhoun, noting that his team spent half of the planning process talking about how to activate the public plaza. In order for Base Village to be a success, he adds, it has to appeal to all generations. Adjacent to the ice rink, a building designed as a community center will host pop-up vendors and events this winter as its long-term programming gets finalized. Expect anything from live music to film nights to yoga classes to kids’ activities in The Collective Snowmass, which is slated to house a restaurant next winter and possibly the Ice Age Discovery Center, home to fossils and displays about the 2010 find in Snowmass that unearthed some 36,000 bones of prehistoric animals. Meanwhile, Snowmass’s dining options expand with two new restaurants. The Limelight Hotel’s Lounge will be similar to its Aspen counterpart, with a menu focused on pizza and Italian comfort food, frequent live music, and the addition of a large children’s game area. Ivory Coast–born and Paris-raised Mawa McQueen—who has two other local eateries and a catering business—will open the Crêpe Shack in a smaller residential building near the plaza. Of course, a ski resort village wouldn’t live up to its name without lodging options, whether for a weeklong vacation or as a second home. Owned by Aspen Skiing Company, the Limelight Hotel adds 99 casual luxury rooms to the short-term rental inventory, plus 11 wholly-owned residences—nine of which are penthouses. The exclusive Lumin building includes just three large residences, mere bootsteps from the Elk Camp Gondola. 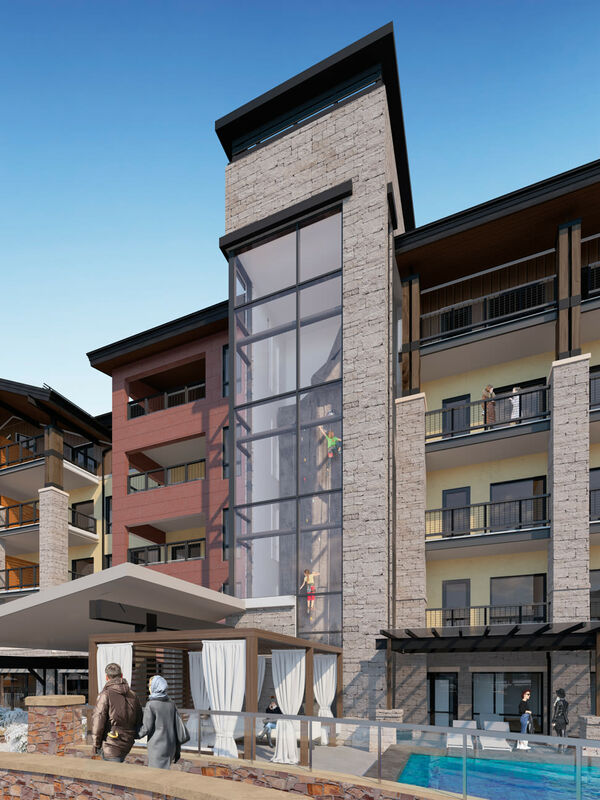 Perks of ownership in both buildings include access to the new private Snowmass Mountain Club, which offers members parking, a ski valet, family lockers, a lounge, and social programming. To be completed in summer or fall of 2019 are two buildings flanking the parking garage that will make up One Snowmass, 41 alpine modern residences with a mix of whole and fractional ownership, plus more restaurants and shops and, for owners and guests only, rooftop infinity pools. With a grand-opening celebration planned for December 15, the $600 million, 10-year Base Village project will take one giant step closer to completion. First approved in the mid-2000s, partially opened in 2008, and on its fourth set of owners, it is currently the largest ski resort development project in North America. And although a few more residential buildings are planned around the perimeter, the village core—and thus most of the public amenities—will be largely complete by the end of 2019.